High-level trade talks between the U.S. and China have ground to a halt as the Trump administration threatens to escalate a trade war that shows little sign of abating, according to five people familiar with the matter. Source: Hatzius, et al., “Dissecting the Effect of Tariffs on US-China Trade,” Goldman Sachs, 9 July 2018. 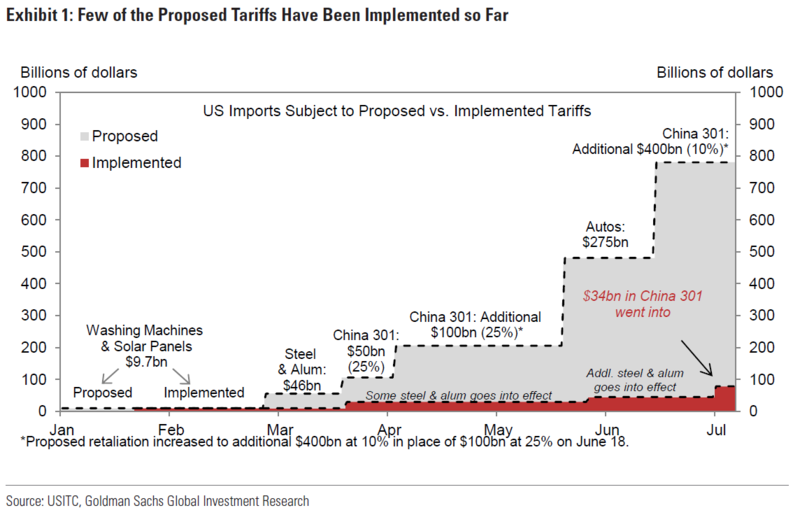 The graph from Goldman Sachs is already slightly overtaken by events — but one can see more and more of the tariffs are inching toward reality. When last the Trump administration released a list of taxable imports from China, the Chinese MoC announced a counter-list within hours. It might take a little more time for them to calibrate a response for $200 billion worth of goods — but I’m gambling on a timely response. The timing of the taxes on imports is probably off by a few days. The public comment period for the additional $200 billion of imports to be subject to Section 301 tariffs ends on August 31 — so more likely we see the imposition in September. This entry was posted on July 11, 2018 by Menzie Chinn. Got a 15.25 ounce can of Whole kernel corn for 44 cents today. Eat it suckuhs!!!! Seriously if anyone can beat that price at any type of commercial store (buying cobs directly from a farmer doesn’t count) I’d love to hear the price and the city you are commenting from. I suppose if someone got a larger can at a bulk store they can beat that price on a per ounce basis, but I bet you’d play hell getting a lower price on a 15.25 ounce can. If there is a problem concerning China expropriating US patents and proprietary technology, what do you think is the proper strategy to stop claimed improper activities? If you read Professor Chinn’s prior posts, he has written AD NAUSEAM about this. Mainly related to punishing ZTE, and those categories that actually qualify as national security threats. Also I would argue much of this American companies have brought this upon themselves. If China promises markets they have no intention of opening to foreigners, and American companies are dumb enough to volunteer trade “secrets” or volunteer proprietary info in return, China can’t bear 100% of the blame for that. After Lucy pulls the football back from Charlie Brown’s kick, and Charlie Brown goes flying in the air the 20th time, who is to blame for that?? Charlie or Lucy?? No American President, Obama or otherwise, has held a gun up to American CEOs heads to hand over specialized production or specialized manufacturing knowledge—those CEOs chose to kick when Lucy (China) yanked away the football (“the football” read as: domestic Chinese consumer and domestic business markets). By the way, Dean Baker, makes a rather salient point about the intellectual property issue, below. I would add that discussion of trade and tariff always forget the effect and change in exchange rates that occur. As Trump is trying to raise “import” prices to Americans and American firms by tariffs, he is fighting the force of exchange rate as the dollar’s trade weighted value rises, particularly its value versus the Reminbi. “…This is where I come in. I don’t particularly consider the fact that China doesn’t pay Microsoft, Pfizer, and Boeing what they think they are owed to be a problem for people who are not major stockholders in these companies. As a basic proposition, the more money China sends to these companies, the larger its trade surplus in other areas. More generally, as a basic proposition, it is more than a bit bizarre that so many economists can somehow believe both that without patent and copyright monopolies and related protections, there would be no incentive for innovation and that technology causes inequality. If we have a problem with inequality due to “technology,” it is due to the way in which we assign property rights. Shorter and weaker patents and copyrights mean less money to the people on top and more money for everyone else. This is what Dean Baker was reacting to??? Jonah Goldberg is perhaps the dumbest person on the planet. OK – he is echoing the nonsense we see here from PeakStupidity. Wait a second – is PeakStupidity the same person as Jonah Goldberg. That would explain a lot! Pgl, I’ve already explained in detail how your socialist beliefs reduces inequality and also reduces living standards. Yet, you remain determined to make everyone poorer. You’re completely unaware you’re the “stupid” one. Pgl, only the dumbest person on the planet would call others the dumbest person on the planet. You sir, win that prize! You need to understand mainstream economists rather than just following far left economists blindly. Generally, IP rights and protections encourage innovation and reward entrepreneurs. It’s America’s virtuous cycle of big risks and hard work to lead the world in innovation, invention, and entrepreneurship. It creates good U.S. jobs, and benefits the global economy enormously. Generally, weak IP rights and protections reduces inequality, but that’s short sighted, because big risks and hard work won’t be undertaken without the prospect of big rewards. Therefore, improvements in living standards slow, perhaps substantially, and everyone becomes poorer than otherwise. Before some people comment can I remind people of a classic line from the 2nd dirty Harry movie. A man gotta know his limitations. He was a wonderful philosopher!! I’ve always been aware of my limitations, Tootie Pie. Question: where would tariff money come from: consumer or shareholder or Chinese manufacturer? Let say US brands hire a Chinese manufacturer and then add 2/3 of the China cost as profit (reasonable), so then on 500 billion in imports there is a like a trillion (and likely much more) in US profits — that’s dividend and share buyback stuff, that’s like one of the sources of growing inequality in the US. A tariff of 25% would eat like 120 billion in profit, 12% of it. Or the consumer pays 125 bil or China devalues by 100 billion, 20% cost. Is this time to short anyone who manufactures abroad? Is this peak Amazon? Is it a waste of time taking an outsourcing class in a business school? Question 2: How high must the tariff be for profitable manufacturing of the same thing in the US (if at all it is possible)? Would this pull people from the “third world economy”, aka gig economy, within the US “developed economy”? Is this peak Uber and the like? Question 3: How high must the tariff be for balancing the federal budget? Question 4: Will the announced and well-received Tesla factory in China provide more ammunition to China, as it will try to suffocate the marker share US companies doing business there? Or should we require that Tesla and anyone else with substantial presence in China register as foreign agents. I know this isn’t an entertainment blog and and movie recommendations aren’t exactly appropriate here. But it’s hard to find well written and acted stuff, so I thought maybe some people appreciate if I passed along some good ones. I’m a Diane Kruger fan. I think she’s quite a striking woman (and I usually don’t go for blondes) and also she is a better than average thespian. Liked her in Inglorious Bast*rds and the short-lived TV series “The Bridge” where her character seemed to have a very mild version of Asperger’s Syndrome. This is also quite good, called “In The Fade”. If you are the type of movie goer who doesn’t “require” a happy ending or a nice bow ribbon tied at the end of the films you watch to feel satisfied, I give this a strong 8 on a 1-to-10 scale. I think it shows some hard truths about Germany today, and other countries on the Eurozone periphery. And I like how Kruger’s character stays true and loyal to the things and people she cares for. The real deal is that we wanted Germany to be a captive of our fossil fuels while Ukraine wants access to Russia’s fossil fuels. Of course we could sell our oil and gas to Ukraine – right? The Trump apologists made this argument with respect to soybeans but for some reason it does not apply to fossil fuels? I guess this kind of inconsistency is explained away from those Nobel Prize winner economists on Fox and Friends. Pgl, there has been recent discussion for the need of resourcing critical needs from safe allies. Just as a reminder, I believe Russia has been the most frequent antagonist for which NATO exercises has been held. Does any disagree? Can anyone remember or cite an instance where NATO exercises were against the US? Is the US or Russia the safer ally for the NATO members? FYI – the Nord Stream 2 pipeline issue and NATO are two very, very different issues. Unless you are advocating we send in the military to blow up this pipeline. Now if you think Putin is a better ally – pray tell why he did not come to our aid after 9/11? Our NATO allies did. Malarky, the Russians have been allowing overflight to supply [at huge cost to you] our 17 year quagmire in Afghanistan for years. Our ‘allies’ are dumb enough to send US a few nits for the quagmires, they are sending more money to Salafi terror funders than US is. But US is selling more arms! Pgl, and there you go again proving yourself to be the dumbest person on the planet. Crimea, Donetz….. excuses for moving NATO offensive capacity into Estonia………. It is possible Merkel is too polite to point out NATO is no longer defensive. The film shows in the first place that it is stupid/dishonest to make a film based on actual events when the trail is not finished. Hint: The DVU lady got a life sentence a few days ago, there was no reasonable doubt, but a long trail with clear result. If you really want to make a film then rising everyday Antisemitism in Germany would be a good start, however, my feeling is that an dirctor like Fatih Akin would find it a little bit too disturbing that the (white) victims are attacked by guys with mainly ME or Turkish background. I understand that his actual film is easier for him. It’s a work of fiction. Fatih Akin is a writer, writers have been known to create works of fiction from time to time. Architects also build buildings sometimes. However, there are a large number of such neo-nazis and “golden dawn” people that exist in Germany now, and native Germans creating violence with very little reason. So in that sense, even though the story follows no “real”/non-fiction story exactly, it is very believable and very realistic story arc. I dare say, more realistic than most Hollywood films as far as events and also the characters general behavior. Possibly the most “unrealistic” part of the story is how ethical the lead investigator was in tracking the chain of evidence, and how he doesn’t “push the issue” on the victim’s drug use. If the story is based on actual events of a trial—I suggest you leave a link of the supposed trial the movie story is “based on”. Because it leaves many of your claims sloppy when you don’t identify the trial you are referring to, not to mention your poor use of the English language. I say all of the above as an American with a significant portion of German blood. Sorry, that is kind of lame. He used the theme because it sold well due to the actual trial, everbody I know who watched the movie felt that in Gerany and Austria Therefore, my points stay. He could have made a very good documentary afterwards, here the focus should have been the blindness of some German intelligence agencies on the right eye. And BTW, you can’t have it both ways: Either the film is fiction then it may have no relevance for the actual situation in Germany, or the film has relevance then it should provide correct information. YOU sold it as relevant, not me. First you said it was a specific trial and the writer/director got that wrong—now you say it has “elements” from different trials. You proved my whole point in your last comment, and I appreciate that. You’re a little slow, so I’ll repeat the point: The case is not based on any one trial or follow any specific story exactly, as you misrepresented (lied about??) in your first comment. But the film is quite believable and has a realistic story arc. I would think, if you are German as your name and comments imply, you could at least get the facts straight. If you live in a community where all your co-horts are bitter towards immigrants because they have no accomplishments in their own lives, I feel sorry you are stuck amongst them. We have a similar problem with many USA Americans of the Southeast portion of our country. Many southeast USA Americans are of the belief that any feeling of emptiness and lack of accomplishment by themselves is solved by taking their index finger and pointing and saying “Oh, look at that brown colored person over there—that must be the reason I’m a loser.” It’s quite useful for the self-esteem. As an American with a significant portion of German blood I have always felt Germans above average intelligence (Ex: All the German Jew physicists leaving Germany at start of WW2, yes they were mostly Jews, but where did they choose to go to university, research and teach??—>>Germany). Assuming you are German, I’m going to have to re-evaluate the high-intelligence ranking I have given my own ethnic group. The timing of the film and the implications were quite obvious for most people in Germany and Austria who watched the movie, the actual background gave perfect promotion. And the question still is why the twist with the trial? The justice sysrtem workks, part of the police not. A little bit slefreflection usually does no harm. The direct message of the film (there are no “implications”, the film’s trial takes place in Germany, not the made up land of Absurdistan) is obvious to anyone who can read a newspaper, not just the the German and Austrian racists you commingle with. Now you’re going back to the “it was based on one trial” theory again?!?!?!?! I suggest you take some pills for schizophrenia or learn to present a cogent argument. And you are not an emigrant. No recent emigrant to Germany or Austria (it’s strange you mention Austria, another tip-off of your true intent) would present the argument you are making. You are doing as many racists do online, crawling back to your hidey-hole like the coward you are, thinking typing “I’m an emigrant” is going to inoculate you from spewing bullcrap. Sorry, doesn’t work with me. The Trump cheerleaders here do not even seem to know what he was bloviating about during the NATO meetings when Trump made that utter stupid comment about how Germany is a captive of Russia. This morning Trump bragged about bringing up the Nord Stream 2 pipeline construction as he for some reason suggested that this was now OK. Why the change of heart? Could it be? Trump read this and actually understood reality for once? His cheerleaders on the other hand have been totally lost as to what the issue even is. Heading of the last fact presented. This is a very different figure Bruce Hall tried to portray yesterday. Of course Bruce never really the point is this discussion – as usual. Pgl,one of the key words used in the https://www.nord-stream2.com/project/facts-myths/ is diversification. But in reality they admit the new pipeline will be used to meet and exceed the EU’s future need for gas. Instead of diversifying it is centralizing and focusing W. Europe’s growing need on Russian gas. And yet you believe others who point this out bloviating and stupid. That sir is exactly what you just did. yo have been totally overtaken by your TDS driven need to argue every point made by our President. Diversification is fine. The simple point in case you forgot was that Trump got this ALL wrong. But how could you forget? You were defending Trump’s absurd claims. Leave it to you CoRev not to remember the stupid BS you wrote just yesterday! 1) NordStream 1 and the existing pipelines via Ukraine/Poland are already UNDERUSED. 2) NordStream 2 allows to shut down the pipelines via Ukraine/Poland. Try to understand why this is an advantage for Russia and Germany and why we see this charade by US politicians. 3) There are no plans to substantially increase imports from Russia by Germany, slight increases are expected due to decreasing production in Norway and the Netherlands in the medium term before the energy transition kicks in. 4) The only larger country with a dramatically increasing demand for import NG is UK. 5= Pieline NG is much cheaper than LNG. Pgl, do you know who owns NordStream2? Would the Brooklyn Economist FULLY BELIEVE the Facts & Myths explanation put out by that owner? Or is the desperation so strong to denigrate Trump, and his supporters that all that background information is ignored? Just wondering what the wide eyed Brooklyn Economist would believe. You ask a lot of questions where you provide no answer. Enlighten old wise one (snicker) who owns this pipeline and why does it matter? Interesting – Nord Stream AG is a German affiliate of Gazprom. Maybe Trump meant to say this affiliate is a captive of Russia. After all, Putin owns a lot of the shares of Gazprom – sort of under the table. And I bet Putin is letting Jared have a few shares as a kick back for all the great work Trump is doing for Putin. So what do we find? Pgl blames TRUMP for almost any and everything, but totally ignores that Gazprom, “The company is majority owned by the Government of Russia, though technically private. ” So Komrad pgl clearly is a Russian agent and believes Putin over all of us and the US Government. Dumb is as dumb believes!, Komrad pgl! he Nord Stream-2 gas pipeline construction project, received funds from five European companies totaling 324 mln euros.In April 2017, Gazprom and five European companies – France’s Engie, Austria’s OMV, British-Dutch Royal Dutch Shell, Germany’s Uniper and Wintershall signed an agreement on the new financing model for the Nord Stream-2 gas pipeline project. Loan margins that high is sort of like borrowing from a loan shark. Did the big boys think they were loaning to Trump Enterprises which would imply the borrowing is a bad credit risk? At the end of the day – Nord Stream 2 might become a captive of these lenders! And after all of this interesting information – how does CoRev respond? Firing off more pointless insults. He really needs to take his meds! Pgl, it’s kinda fun following your commenting example. BTW, what interesting information and what insult, Komrad pgl? Ownership of Nordstream: It is no secret tha Gazprom pays for Nord Stream 2 and owns it. What is the issue? International companies from various European countries finance the Nord Stram pipelines. So what? So what? Trust of Russia? 1) Physical aspects like flow rates, future demands etc. Then give me one good argument why the German government should not support Nord Stream 2. That is an excellent question. Some tentative answers. 1. American companies are not required to do business in China nor accept any and all terms. Nobody is forcing them into technology-transfer focused contracts. John Cochrane made this point in a blog post not so long ago. 3. In the past, various pundits have proposed trade measures targeted at China. None of these pundits have suggested let alone promoted the strategy of picking a trade war with all of America’s significant trade partners. 4. Aggressively targeting any trade partner will not make up for poor human capital on the part of some American workers. Nor will it compensate for the difficulty that Americans experience playing with each other. America’s social capital problems will not be solved through la Trumpette’s Trade War or any other international diversion. Bread and circus will not fix America’s fundamental economic problems recognizing that on average US per capita real income remains very high and many American sectors compete extremely well in international markets. Thanks for the reply. I agree that no one forces companies to open shop in China, so perhaps a version of “seller/buyer” beware is appropriate. I was also thinking about claims of expropriation through hacking. I assume the best defense is better Information technology (IT) protection by the US government and by business. Other than better IT protection, I was trying to understand if there are other appropriate responses. Is this an area for the WTO? I know very little about the WTO and whether it is an appropriate venue for hacking complaints and whether China would comply with any rulings by the WTO. I have not read all of the posts regarding the trade dust-up posted by Professor Chinn, so perhaps I have missed the suggested proper responses previously posted. A quick google search finds this expression (and the related “the trade balance deteriorated”) used many thousands of times by various writers. I know that is wordier, but saying “the trade balance improved” lends credibility to the view that trade surpluses are always good and trade deficits are always bad. That is not true, of course, and I doubt Mr. Ip intended that interpretation. But in light of all the craziness going on lately with regard to trade policy, it is best not to inadvertently give aid and comfort to the crazies. US 1 Yellow Soybean Prices were mostly 23 cents lower for a state average of 7.69. Distress? What distress? Meanwhile GOP politicians are telling farmers that they should be proud patriots as frontline soldiers in the trade war. One soybean trader called yesterday’s session a “bloodbath”. Remember the Whig Party which became Lincoln’s Republican Party? They imposed tariffs on goods produced in the industrial North which basically screwed farmers back then. The farmers became soldiers all right – for the Confederate Army. Yep. I grew up in the Chicago area, so Lincoln was always lionized. We even got off school for his birthday. He was a great lawyer & President, but a really lousy economist. He also espoused the infamous labor theory of value. Nullification was tilted over by Jackson against Calhoun way before. And there goes our resident dumbest person on the planet: “The farmers became soldiers all right – for the Confederate Army.” Pgl forgets there also were farms in the North. In 1860 58% of the total population lived on farms. “The population of the Northern States was about 22 million while the South had a only about nine million persons.” Therefore , the North had access to many, many more farmer soldiers than did the confederacy. Or is doing simple math too difficult for the dumbest person on the planet? Did I kill your dog? Or steal your girlfriend? You make a lot of really weird and pointless comments. Pgl, just correcting the record of the dumbest person on the planet. “The dumbest person on the planet” stole your girlfriend? OK. I guess she left you for all sorts of other reasons (rude, pointless, never getting over any shred of angry – and of course, not good in the sack). C’mon CoRev – if you want to go on and on with the pointless insults, try have a chat over at Mark Thoma’s place where this stuff runs wild. A few of us come here for actual economics (which of course you never get). There’s no need to bring Mark Thoma into this. He’s a very respectable man, a respectable hard-working professor, and the greatest amalgamator of economics information on the internet, and arguably one of the greatest amalgamators of usable news—PERIOD. 80%+ of the time I take your side on this stuff pgl, but there is no need to yank a very good human being into the mud of a personal argument. You can’t blame a blog host for allowing his commenters freedom of expression and freedom to voice their core feelings/beliefs. I am sure Thoma doesn’t like many commenters views, but he allows the dialogue because that is how the sharp sword of truth is made—it is forged in intense heat and they hammer the sh*t out of it. Pgl, if and when you discuss economics it is rare. you are always insulting someone. Why do you protest when it is returned, Komrad? 2slugs, if forced to sell at that price, can you tell us what loss a farmer would accrue for each 100 acres of soybeans? A little research will find the averages for you. CoRev If the Iowa farmer planted soybeans expecting $10/bushel and only got $7.69/bushel, the loss would be something in the neighborhood of $12,000. The average soybean acre in Iowa yields around 50 bushels per acre. Of course, you’d be hard pressed to find a 100 acre soybean farm in Iowa. That’s about the size of a hobby farmer’s plot. 2slugs, let me get this straight. In economics “loss” is measured form expectations versus costs? Is that right? If so you actually desperately need to read the business text. In business it is the difference from costs to receipts. Average costs are also readily available if you care to try again. But, it is all hypothetical, since if you note my other links and comments almost no soybeans are being sold. CoRev: How is an opportunity cost measured? In economics “loss” is measured form expectations versus costs? Is that right? you actually desperately need to read the business text. I have. And you clearly do not understand how to estimate a loss. If a farmer expects to get $10/bushel and commits funds to that expectation, then anything less than that expectation represents an economic loss because the farmer missed out on the second best alternative to that investment. That’s the correct way to compute a loss. That’s what you’ll find in any econ or business text, unless you’re talking about something that might be taught in high school. Or maybe you learned something different at the Dale Carnegie school. Again, this is an econ blog. Please make an effort to learn some actual economics. BTW: ($10 – $7.69) X 50 bushels/acre X 100 acres = $11,550, or ~$12K. Menzie, opportunity cost is not the issue. Actual LOSS was the question: “… what loss a farmer would accrue for each 100 acres of soybeans?” Maybe you and 2slugs can share that business text. Menzie, see how easy it is to be snarky? I normally wouldn’t be so snarky, especially to the author of a blog I respect, but you’ve made it your mission to demean. CoRev: Opportunity cost is not a loss? CoRev Opportunity costs are real costs. They’re just as real as the cost of fertilizer or seed or fuel. The profit maximizing farmer will try to equalize the returns across all investment opportunities. That’s how any decent econ text would explain things. It’s how any decent finance text would explain things. It’s also how any decent business text would explain the proper way to calculate losses. Of course, there are lots of very bad and high schoolish business textbooks out there, but presumably anybody reading this blog is well beyond that kind of approach. Any business person (including farmers) who doesn’t understand this won’t be in business very long. A farmer determines how much to plant based on the expected return on the marginal acre planted. The farmer will plant until the marginal cost equals the expected marginal revenue from the last acre. So if the marginal cost is $10/bushel for the last acre planted, then the farmer will plant only enough such that the expected marginal revenue equals $10/bushel. If at harvest time the farmer does not get that $10/bushel, then the farmer will incur economic losses because the marginal revenue received will be less than the marginal cost incurred. In other words, the expected marginal revenue is a key input to the planting decision; it’s not just a “Gee, I sure would like to get $10/bushel” wish. If you make a business decision based on an expected return and that expected return is not realized, then you’ve suffered a loss. Menzie & 2slugs you are using two different definitions for opportunity costs. Menzie, just wrote an article referencing Indiana’s definition. I then referenced an Ohio definition including a spread sheet. Both Indiana and Ohio are actually calculating the break even price. I could be convinced that the breakeven price is the baseline for calculating LOSS. but 2slugs your definition is not included by either Indiana nor Ohio. Your calculation is wrong. I have seen $8.50 and $9.50 as average cost to grow soybeans. So instead of $10 in you formula is should have been either of those averages or calculated Break Even price to start the calculation. Menzie if you were using 2slugs definition for opportunity costs then you are in conflict with you later article’s definition. CoRev First, in that comment I was just using $10 as an easy and round example. Second, I referred to marginal cost, not average cost. Not all acres on a farmer’s property are equally productive. Marginal land is withheld from production if expected prices are low. Lastly, strictly speaking I probably should have referred to a long winded phrase like “the marginal value per acre” rather than “price”, but price is more convenient shorthand. 2slugs, “First, in that comment I was just using $10 as an easy and round example.” So you just guessed at a price price then did you calculation. OK, but then you went off on the “opportunity cost track” which is not used the same way in ag. as you think. Comparative/cost benefit analyses is used in pre-planting decisions as we both agree, but determining actual profit and loss for a crop is done at time of sale or to determine tax requirement as in any business. This step is so normalized there are many FREE FORMS on the internet to help in calculating. That business text is still calling your name. You were almost correct had you listed price as Break Even Price. That would have been adequate for estimating at this level, but the failure to adequately identify that value and then insisting opportunity cost was the appropriate way to do economics was the tell tale you were winging it again. CoRev Do you understand the difference between average cost and marginal cost? 2slugs ducking and weaving even again asks: “CoRev Do you understand the difference between average cost and marginal cost?” as if it actually had some value. This was the original question to him: “2slugs, if forced to sell at that price, can you tell us what loss a farmer would accrue for each 100 acres of soybeans? A little research will find the averages for you.” Averages is what was asked and expected! After his first estimate was challenged, he went off talking about opportunity costs, and when that was also challenged is talking about marginal costs and revenues. The original question was a test of his knowledge. All he needed to do is explain where he got his original $10 cost. With the detailed gibberish that followed, 2slugs failed to recognize that the $10 was the cost, breakeven or average cost to produce. Any receipts in excess are profits and below losses. Nope! He had to show us how well trained in economics he was. 2slugs, yes, i know the difference between marginal and average costs, but in re-reading your response it appears you are very confused. Marginal land????? How did that get into your ramblings about marginal costs? Just wow – no wonder your girl friend let you! Again – most people having realized they are a deep ditch, they decide to stop digging. But you dig even faster! Konrad pgl, I do recommend you continue reading the commenst to learn something, but please desist commenting. Your commenting is becoming an embarrassment to Brooklyn. (With apologies to Barbara Tuchman.)???? More like apologies to Dr Jim Hamilton who can’t even stay on the first d*** [edited by MDC] page of his own blog for a full ten days b/c his co-blogger posts as if he has a quota to meet. It’s referencing the title of a book, dumb-a$$. But let’s be fair, her “The First Salute” is much better. So the BLS reports that the CPI-All rose 2.9 percent over the last 12 months. That’s probably pushing the edge of the Fed’s tolerance zone. And all of this before the Trump tariffs have started to bite. While the tariffs should be a one-time level shift rather than an increase in the rate of inflation, empirically it might be hard to separate out any spike in the price index due to the tariffs from ordinary inflation inertia. I recall that the Bank of England had a similar difficulty after British prices spiked due to a VAT increase. Trump isn’t making life easy for the Fed. Isn’t this the same period where nominal compensation has risen by 2.7%? PeakDishonesty and his Minnie Me (CoRev) told us how much real wages have gone up. Only these two can subtract 2.9 from 2.7 and get a large positive number. Must be some advanced form of Fuzzy Arithmetic! With all due respect to the Guns of August analogy, I think the Franco Prussian War might be a more apt reference than World War I. Trump’s tweets are a pretty good substitute for the Ems Telegram, although if anybody is Bismarck in this whole mess for sure it isn’t Trump. Anyhow, the Franco Prussian War was a disaster for France, led to internal turmoil/civil war, and pretty much ended serious French pretensions to being the premier power in Continental Europe. If I had to guess, Trump’s trade war will be a disaster for the United States, Trump’s presidency will lead to internal turmoil, and in retrospect the American role as global hegemon will be said to have ended as a result of Republican policies beginning with the invasion of Iraq and ending with God only knows what. Do you think the Trumpette Trade War will catalyze a conversation that will manage to materially educate lay people on some basic international finance concepts? Starting with the balance of payments perhaps? I wonder. Educated elites either get it or are open to a better understanding, I would like to believe. Others? One would hope so. Menzie is trying but the Usual Suspects are so polluting this comment section that the confused journalists will get even more confused. Like a lot of things, much of economics is not intuitive. But with other disciplines (e.g., medicine, physics, electrical engineering, etc.) people recognize that they don’t have the skill set to understand the topic, so they accept the views of people formally trained in those disciplines. But with economics people tend to equate it with the economics of the household (which actually is the Greek root), so they tend to believe they know something about the subject. It’s the same problem that Angela Merkel exacerbated when she appealed to the economic knowledge of the “Swabian housewife.” So you end up with nonsense about how governments need to tighten their belts during a recession just as households do, or believing that the government should only increase spending when the economy is booming and we can “afford it”. Or the strange appeal of mercantilism. I don’t think it’s hard to discern which commenters at this blog have had formal training in economics and which ones are just winging it based on gut instinct. I see Menzie is at it again and not showing all comments. RTD is proud! CoRev: Pardon me for going out last night to see a set of performances by associates at the Atlantic Center for the Arts. I will make sure I post your comments from my iphone as soon as they are posted, skipping over PeakTrader, AS, and Moses Herzog, because your comments are from a “superior intellect”. Menzie has a personal life and socially interacts with people with fulfilled, contented, and active lives!?!?!?!?!?! The whole reason I come here is because I related to him and felt a special connection to him as someone who I assumed, similar to me, had a dead social life. I feel cheated now somehow…..
Oh well, back to my intravenous feed of Mountain Dew and 20 hour days playing “The Last of Us” on my PS4. You can’t win them all folks…..
I’m not for censoring, but the marginal cost of skipping over Moses Herzog may very well be close to zero. Although I purposefully skip over Moses Herzog’s posts, so it wouldn’t matter to me. Menzie’s post supports my (half-serious) thought that Moses Herzog is Menzie’s alter. It’s high-praise and a high-compliment being compared to Menzie (a compliment I have neither earned nor deserve). Although no one will take what you say seriously when they are still getting chuckles after your toddler-like crying over your perceived “mistreatment” as a resident of NYC. What a pity for me, as I rather enjoy that rumor being disbursed. Rtd, I would add real and nominal costs of skipping Moses’ comments are also zero. BTW, when you first started commenting about the quantity over quality and demeaning posting I was ignorant, but now having experience on both, I agree. We’re seeing a lot of both. I see PeakDishonesty and Minnie Me (you) are off on unprovoked and really pointless personal attacks. The two of you should have been on the House Committee that was dishonestly slamming the FBI agent yesterday. Everyone said it could not have gone lower but you two would have managed to exceed expectations. Both volume and open interest are ZERO. Another interesting phenomenon is how many bids are actually available and for when at local granaries. In VA, 2slugs area, there are zero soybean bids so far in July, and those bids showing are for 9/30/2018 DELIVERY. You are one busy boy trolling every source of information that you can cherry pick and misrepresent! Hey – give Wilbur Ross a buzz and maybe he will share some inside information that you can trade and profit on! Pgl,calling some one a troll who gives links and data for their position, and claiming cherry picking without referencing the source of the claim is truly dumb. But we already know where you rank on that list, dumbest of the dumb. Have you done that simple math yet regarding confederate farmer soldiers versus the North? What you provide is a pack of gibberish. Oh wait – since you do not even get the topic, you think it is enlightening. Snicker! CoRev I don’t live in the VA area. Haven’t lived there for many years. Tens of thousands line the streets marching for Donald Trump! They must love him! Oh wow – the language. This must be FAKE news as these Brits shown on our news coverage really seem to hate Trump. Anyone have any clue why? London is full of liberal/socialists. The mayor is also a Trump hater. I doubt many of them voted for Brexit. The activist protestors are a product of fake news. Many of them are likely unemployed or government workers. They don’t understand why the country is much poorer than the U.S.. They want more freeloading, because they live in tiny houses, drive small cars, ride bicycles, take a bus, take a hike, etc., have low incomes, high taxes, high prices, etc.. They’re very idealistic and unrealistic. PeakTrader You’re right that Londoners voted against Brexit. The vote broke along well defined lines. 100% of the constituencies in Scotland and Northern Ireland voted against it, as did London. And 100% of the constituencies in Wales and England outside of London voted for Brexit. Put another way, the economically sophisticated areas in Britain voted with “Remainia” and the knuckle draggers voted with “Leaveania”. Britain is poor for many reasons, but most of the recent damage is due to the idiot Tory party and their stupid austerity programs. Brexit will go a long way towards making Britain a poorer nation because it will hurt productivity. Correction, it’s already hurting labor productivity. And guess what? Trump thought Brexit was a great idea! No wonder Londoners are protesting against our Moron-in-Chief. You mean like America breaking away from Britain? They stood by us after 9/11. And Trump decides to insult them anyway? Oh wait – you and Trump are Putin’s poodles. Got it! They probably did not vote for that stupid thing Brexit. City dwellers tend to be educated than the hicks that voted for Trump. Pgl, big cities attract the worst people from the countryside like a magnet. The relatively few rich in the big cities barricade themselves from them or live in the suburbs. You must be having a bad day – 12 of your best friends indicted! Pgl, again shows why he is the dumbest of them all: “City dwellers tend to be educated than the hicks that voted for Trump.” Elitist Hillary called those hick deplorable and lost the election. And you continue with the same attitude, what will you do in Nov. when even more seats are lost? CoRev Actually, Hillary Clinton got 3 million more votes than Trump. She lost the election because rural areas are overrepresented in the Electoral College. As to this November’s election, it’s hard to know what effect GOP gerrymandering will have. Genereally the Dems need about 6 percentage points more votes to break even in the House. 2slugs, I know “Hillary Clinton got 3 million more votes than Trump.” And the were nearly all from the urban centers, but that’s not the way we count votes. It’s that way for an excellent reason anticipated by our founders. You may dislike it, but they anticipated well what could happen. I remember well your comments re: demographics and Dems winning forever. CoRev, you might want to further familiarize yourself with the system for choosing the President devised by the founders. Originally, the candidate with the most electoral votes became President, the runner-up Vice President. Those founders foresaw the country understanding the importance of the electors themselves. In The Federalist Papers #64, John Jay commented extensively on those who chose electors (including “select assemblies” and “State legislatures”) understanding the importance of their task, and of the electors acting in the best interests of their citizens. Hard to imagine that system could have produced a President Trump and a Vice President Clinton. Nonec, exactly why the system was changed: They did “…imagine that system could have produced a President Trump and a Vice President Clinton.” We even needed a constitutional amendment to correct it, the 12th. Those dirty, dirty liberal/socialist UKers. Their per capita GDP ($43.6K USD according to the CIA World Fact Book ) is indeed below the U.S. But it is higher than Japan and Israel and South Korea among others. But interestingly, when you look at U.S states 9 of the 12 states (plus D.C.) with the highest per capita GDP are liberal/socialist states. All heavy Clinton supporters. And 9 of the 12 states with the lowest per capita GDP were, yes, solidly in the Trump column. Purple Maine, Florida, and New Mexico were the other three. Looks like the UK is even with Arizona and above South Carolina, Alabama, Arkansas, West Virginia, Idaho, and Mississippi. So good these 9 red havens of freedom are not as idealistic and unrealistic as the UKers or burdened with high incomes like those in states controlled by those awful liberal/socialists. Noneconomist, I wouldn’t call liberal/socialists “dirty.” Don’t know why you believe they’re diirty. They are an embarrassment. Krugman showed people, of all political leanings, are attracted to big metropolises, in any state. Of course, more leftists are attracted to the big metropolises, which is why big cities are such a financial and social mess. You should try living in a republican city, like Huntington Beach California, where the quality of life is much higher. HB is indeed a nice place. But if we’re talking coastal cities by politics, I might also consider Democratic ones like Del Mar, Carmel, Pismo Beach, Eureka, San Luis Obispo, Monterey, Santa Cruz, Half Moon Bay, and my personal favorite, Santa Barbara. There are plenty of others too. I would think you’d be more comfortable in “real’ Republican cities like Barstow and Bakersfield where real men are unemployed at much higher rates while making America great again. Noneconomist, you seem very ignorant about California. There are many great republican cities in Orange County, Northern San Diego, and the hundred mile area between Orange County and San Diego. Moreover, the Central Valley had a lot of development – new areas were built around Tracy, Modesto, Fresno, etc.. You’d be much happier living in Tulare than many of those coastal cities you cited, although it’s much hotter in the summer. You wouldn’t want to live in some of those cities you cited. See Eureka, for example, Clint Eastwood was mayor of Carmel, and another Republican, Sonny Bono, was mayor of Palm Springs. There’s not much in Barstow or Bakersfield. Huntington Beach is not that wealthy compared to other heavily republican coastal cities, e.g. Newport Beach, Laguna Nigel, San Clemente, etc..
You do know , PT, that coastal California covers about 1000 plus miles and that Orange and San Diego counties were in the Clinton column? That many coastal cities, including those in both counties, were in the Clinton column? Carmel? Palm Springs? Clinton too. Or did you not know Sonny has been dead for a couple of decades or that his congressional seat is now held by a Democrat? Or that Clint was mayor of Carmel 30years ago. Of course you didn’t. You might want to invest in an almanac to catch up. Your ignorance of areas north of OC is to be expected, but Tulare Is repped by your favorite American dimwiT Devin Nunes. Kevin McCarthy is your guy in Bakersfield. American because you have plenty of heroes in your homeland, beginning with your President and his American lackey. Before embarrassing yourself again, please familiarize yourself with current California and with California geography. It might pay to invest in a paper atlas. And, let me know when you figure out the difference between cities and counties. Next time respond to what I say instead of responding to what you don’t understand or just make up. Seriously, invest in an almanac and an atlas and do, occasionally read a California newspaper, even if it’s only the OC Register. There’s a big coastal world that exists from the Mexican to the Oregon borders. Inland too, though your failure to recognize those red districts (you’d be right at home in either Bakersfield or Barstow) suggests you have lots to learn. You also seem quite confused on all those new developments around Tracy, Modesto, and Fresno, which are valley cities, not coastal. They’re also places where liberal socialists have made significant inroads. So, please, hustle on down to your local bookstore and find all the material on California you can get. It’s not necessary to embarrass yourself every time you write. OH, BTW, RIP, Sonny Bono. You do know Palm Springs isn’t a coastal city, right? Who am I kidding? Of course you don’t. And, yes, per capita income in the U.K. is over $10,000 a year lower, taxes are higher, and prices are higher. At least, you get “free” healthcare, eventually, hopefully. Speaking of per capita income, PT, your own country is not faring well at all in comparison. Russia’s per capita GDP is about $15K/year below that of the UK. In fact, Russia’s GDP is far below that of California (about $1.3 Trillion less), which has a population of 40 million, far below Russia’s 142 million-plus. I’m sure you can make a good comparison between one of your favorite Republican cities there–Moscow, St. Petersburg–and a terrible liberal//socialist one in California which no doubt you’d like to remake in Russia’s image. There must be some way to lower the California per capita GDP ($58K+) to make it seem more like home to you. And to make California great again too. Noneconomist, my home city, which is slightly republican, perhaps, because a lot of Vietnamese moved in making it less republican, is still a great place to live. And you’re the California expert. No wonder you fled the state owing money. America was great under the Obamas. My Lord – Trump is a gutless weasel. First he bashes Theresa May while in London. The press releases this insult while Trump was dining with her. So the lying coward denies he said what he said. A lot of the Brits wanted this visit ended then and there. Where was Trump supposed to go? His own nation does not want him to return. Oh yea – off to meet with his good buddy and boss – Putin! I keep going back to Figure 1. It seems to offer an implicit explanation as to why equity markets continue to power up. For most of his mandate, President la Trumpette has been mostly bark and not too much bite. Lots of motor-mouth but not too much action. Yet. The tidal wave of economic threats are likely slowing private gross capital formation relative to potential but are not affecting quarterly reports yet in a noticeable fashion. Publicly traded companies that garner media attention tend to enjoy market power. Naturally the Trumpette tax reductions help. The uncertainty he generates will inevitably slow investment but apparently his supporters who seem for the most part to have been born with fetal alcohol spectrum disorder (FASD) and sniffed glue during the formative years do not understand that. Or care.